A row has broken out in a Gwynedd seaside town about the flying of a specially-designed flag on its promenade. Supporters claim the blue and yellow banner gives Tywyn an identity but others say it not representative. 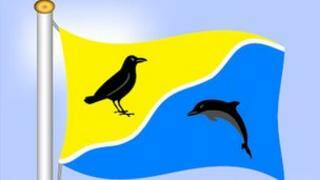 The idea for the flag, which features a raven and a dolphin, came from the town's chamber of tourism and commerce. Gwynedd council owns the flag poles and said permission would be needed before the 'Tywyn flag' is raised again. Tywyn Chamber of Tourism and Commerce chairman Mike Stevens said the four flag poles along the front were only used during the summer and mostly flew the Welsh flag, swimming warnings, and were occasionally changed to reflect events such as royal weddings and Olympics. "We wanted it to look nice and colourful, for it to give the town a bit of identity, and we've had people asking if we will be producing merchandise such as mugs with the flag on," Mr Stevens said. Local man Royston Jones said he was unhappy with any move to lower the Welsh flag, and added that the design of the "Tywyn banner" did not represent the area. "Nobody knows what it is. The raven is said to represent the history of Tywyn, but it is linked to the Corbett family who moved to Tywyn in the 19th Century. The history of the area goes back to St Cadfan in the 6th Century," he added. The chairman of the town council, Alun Evans, says there had been some confusion about who was responsible for flying flags along the front. He added too that a Welsh flag had been taken down to make room for the Tywyn banner, although Mr Steven denies this happened. Gwynedd council say formal permission would be needed before the Tywyn banner can be flown again. Charles Ashburner, the chief executive of the Flag Institute - which researches and documents flags from all over the world - says whilst the design is "bold, clear and distinct, it is not clear to me yet whether it is intended to represent Tywyn or the people of Tywyn". "Planning regulations may also need to be consulted and an unintended consequence of transferring legislative powers from Westminster to Cardiff is that Wales now has far stricter flag planning regulations than England." The Welsh government has been asked for a comment.